The solenoid draw knob glides in and out manually as well as automatically by driving four stationary electromagnetic coils. Each coil was designed to saturate at 14 volts, so power supplies adjusted over 14 volts will not cause loud switch operation. Our compact design allows tight switch placement even in small Moller consoles. 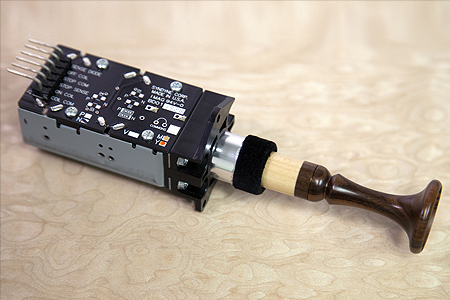 A sealed reed switch and enclosed design protects against dust. The SDK has an elegant feel that is prefered by many over other knobs on the market. Models with 3/4 in travel or 3/8 in travel length.